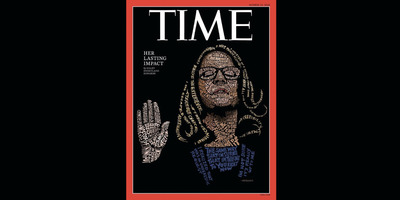 TIMETime unveiled its new cover on Thursday. A San Francisco artist named John Mavroudis created Ford’s likeness using the words from her testimony before the Senate Judiciary Committee last week. “This particular process is like putting a jigsaw puzzle together, but with an infinite number of possibilities,” Mavroudis told Time in article about the cover. “I started with an image of Ford and then drew the words in where they might be appropriate,” he said. Read Time’s cover story, ‘How Her Testimony Changed America,’ here.